Coming to Coeur d’Alene for a romantic getaway? Your choice of restaurant can either make or break a memorable evening with your sweetheart. I think we all have memories of walking into a restaurant thinking it would be a great place to bring our significant other, only to be shocked when we were greeted by unpleasant servers, a loud dining room, and just plain old bad food. Luckily, Ken Huitt of Idaho Trust has three restaurants he recommends as best for couples coming to North Idaho. These three restaurants vary in what’s on their menu, but they all have some things in common that are sure to woo even the most die-hard romantics. In no particular order, here are Ken’s top three restaurant recommendations for couples. Syringa features an eclectic atmosphere, cheery servers, vegetarian/vegan options and an innovative mix of chef-inspired sushi rolls. Coeur d’Alene and Spokane residents can’t get enough of this quiet, locally owned gem. Why it’s great for couples – A small dining room with classic Japanese artistry give Syringa it’s charming, intimate appeal. If you enjoy sushi, this is the place to go in Coeur d’Alene. They only have about a 30 person occupancy so plan ahead and make reservations. Syringa also has a great wine selection, a must-have for couples. Location – Right on 4th street, Syringa is a great option for anybody staying in the downtown Coeur d’Alene area, Beach Town Cottage or the Bennett Bay Beach House are great choices for couples. When To Go – With it’s small occupancy, weekends are sure to be packed. Make sure and call ahead if you are planning on going in on the weekend. 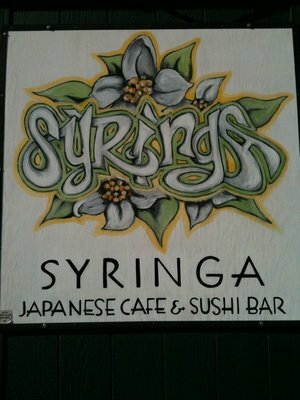 Even on Monday or Tuesday nights Syringa can get quite crowded, so reservations are your best bet here. Beverly’s is a must for couples visiting the Coeur d’Alene area for the first time. Located inside the CDA Resort, walking into the restaurant you will know you are in for a treat. 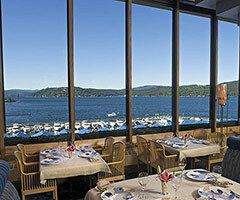 Towering windows that allow for spectacular views of the lake delight guests as they dine on five star cuisine. Oh, and did I mention they have an award-winning wine list? Why it’s great for couples – Location, location, location. I can’t say enough good things about the atmosphere Beverly’s has. The expansive views of lake Coeur d’Alene are enough to make anyone swoon. Beverly’s has over 10,000 bottles of wine available! Their menu ranges from apricot chicken to wild mushroom risotto and firecracker prawns. Location – As if I haven’t already said enough about their great location, you can find Beverly’s on the 7th floor of the Coeur d’Alene resort. Staying in Coeur d’Alene Place or our Coeur d’Alene Condos? Beverly’s is walking distance from your vacation rental. When To Go – Beverly’s is a popular spot for those visiting town looking for high-end cuisine. On the weekends it tends to be busier, but they have a fairly large dining room and professional staff that keeps guests a priority. Reservations recommended. Best Buys – Ken recommends you try Beverly’s happy hour, everyday from 5-7pm. Bonus points if you make even a small dent in their 10,000 bottle selection. Taking your sweetheart out for a skiing or snowboarding excursion at Schweitzer? Stop by the Lodge at Sandpoint and try some exclusive waterfront dining at Forty-One South! Why it’s great for couples – Again, the view takes the cake for Forty-One South. As you can see in the image above, Forty-One South has a great waterfront dining porch, with several tables outside for the summer, and plenty inside for those winter months. Not as pricey as Beverly’s but will run you back a tad more than Syringa, Forty-One South is the ideal stop for couples in the Sandpoint area. Location – 30 minutes away from the mountain, an excellent choice after a long day of skiiing or if you are staying in our Sandpoint Place vacation rental. When To Go – Compared to our other two recommendations, Forty-One South is off the beaten path. Sandpoint is a fairly small town compared to Coeur d’Alene, and this restaurant shouldn’t be too busy except on the weekends. Stop by after swimming in Lake Pend Orielle or skiing at Schweitzer! Best Buys – Ken recommends the fried avocado fritters, a great starter for any meal. Have you tried any of these restaurants? Let me know what you think below!